It's this generation's "Goonies" with a sci-fi twist. Made for people who fondly remember the sci-fi movies of the 80s, along with anyone who just wants to have an amazingly fun time at the theater. Remember watching Spielberg movies in the 80s? That unnerving feeling you got while watching Jaws, or the wonderment that washed over you during your first viewing of ET. How about the first time you watched The Goonies? Those kids cussed like sailors, but that movie has gone down as one of the perennial classics from that time period, and even though Spielberg didn’t direct that one he did have a hand in writing it. So why do I mention these things while discussing the movie Super 8? Well, you’re about to have those feelings brought back in a wave of nostalgia the first time you sit down and watch it. J.J. Abrams, with the help of Spielberg working as a producer, has crafted a movie that works on its own merits, but it’s certainly bolstered by the strong wistfulness that comes along with it. The movie is set in the small town of Lillian, Ohio. A group of kids from this small town are making a homemade zombie movie to enter into a state film festival. Using their parent’s super 8mm cameras the kids set about recreating a hilarious depiction of zombies taking over and a detective trying to stop it. 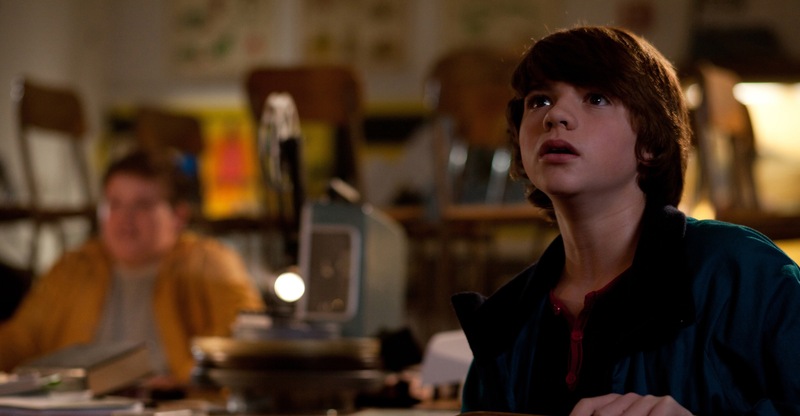 Joe Lamb (Joel Courtney) is the main focus of the movie. Joe is the son of the town’s Sheriff Deputy, Jackson Lamb (Kyle Chandler). Joe and his father are grieving after the loss of his mother in a tragic factory accident. In Joe’s group of friends is a domineering overweight kid named Charles (Riley Griffiths) who steals every scene he’s in. Even though you know that this movie is going to be packed full of that feel-good summer action that we’ve come to expect from big blockbusters like this, believe me when I say the interaction between this group of youngsters is the very best part of the movie. Abrams and crew has found these two young actors in Courtney and Griffiths that have had no previous feature film experience. You wouldn’t be able to tell though. They’re fresh faces and natural demeanor do wonders for the movie. These kids converse like the well-oiled group of Goonies who go in search of buried pirate treasure. There’s more than enough clever adolescent humor to go around. Onto the plot… well, at least what I can divulge of the plot. It isn’t giving anything away to say that “Super 8″ is a monster movie of sorts. You can tell that much from the preview. There’s a large train wreck, and something emerges from the train. The kids accidentally catch a distorted view of it on their camera. Weird events begin taking place in the town and no one can explain what’s happening. An ominous military force moves in to control the situation, all the while this group of kids become deeply involved in what’s really going on. The train wreck is an absolutely jaw-dropping moment. I haven’t felt that surprised by a scene since the first time I saw the rotating hallway scene in Inception. Train cars fly everywhere. Continuous explosions almost force you to the edge of your seat wondering if the madness will ever end. It’s a scene where you’re able to just sit back and bask in its pure popcorn feel. This is a movie that knows how to film action and it’s squeezing out every last drop of excitement possible. Watching Super 8 is a unique experience. Abrams plays the movie much like Jaws where he doesn’t reveal the creature until the third act. I’ve always wondered why more creature features don’t go this route. It’s a surefire way to build suspense while still driving the story forward. However cool the creature and the action may be, the kids are who the movie is really about. These kids are so genuine and so clever, that Super 8 will become this generation’s Goonies, and I don’t say that lightly. This is a well-crafted, well-written piece of cinematic nostalgia that will thrill younger viewers while transporting older viewers back to a time when movies still held a sense of wonder and amazement.